I know that it's early but I'm so happy that I couldn't wait to open this topic for your photo's/video's and reports about these amazing reunion concerts. I've been there once, in 2012, and I had to think about the historical concert in 1994 and Papa Kelly on stage there again. So emotional. It would be great to read here about your happy reports. THIS TOPIC IS ONLY FOR PHOTO'S & REPORTS! I hope this topic is meant for personal reports because I went to the very first show on friday and there is a lot I want to say. I am still experiencing the show in my mind over and over again so this is going to be a long post and most of this is going to be very emotional blabbering so if you want to skip all that you should just read the very last bit of this report. After months of counting down to the day I always dreamed of but never thought would happen, finally arrived. A Kelly Family reunion. My mum and I left in the early afternoon and reminisced a lot in the car about all the times we did the same thing in the 90s and early 00s. Because ohmygod I was so young and ohmygod, nothing had ever felt the same after those Kelly years and ohmygod were we excited and a little bit scared of what the night would bring. The Kelly Family years of my life are by far my most precious memories and if anything I didn't want them to be ruined by a new experience. When we arrived at the venue, at around 16:30, there were already a lot of people queuing and walking around in all their old Kelly merch. Which was funny to me because I wasn't sure if it would be appropriate to wear one of my old Kelly shirts... I could have known though that it would be of course. The first memorable thing for me happened before we were even inside the venue, as a girl with a guitar started singing 'Keep On Singing' and before she even reached the first chorus a whole group of people had formed around her and all started to sing along. This meant so much to me because I always feel like the Kelly Family vibe, including things like this, is something I never experienced somewhere else , but because I was so young back in the day I kind of thought that maybe it just felt bigger and more intense in my memory. Now I knew I had been right all along though, and that feeling only grew stronger as we headed inside not long after. We found our spot inside the catwalk-bit of the stage as we had front of stage tickets (after a security guy drew a heart on my ticket as he checked it but I didn't really understand him because I don't speak a lot of german and I have a girlfriend anyway ) and I realised this was another childhood dream coming true, as I had been close to the stage before but never this close. At this point of the evening I was already swallowing against tears. Everyone around me was smiling and talking about the past and the night ahead, and I know this is going to sound cheesy but it really felt like coming home. After all these years I finally was surrounded by people again that didn't constantly want to make fun of my favourite family but just understood how big this night was going to be. A little after 19:30 the houselights went off and I only managed to look at my mum and yell "oh my god, no" as the band came on stage and immediately started playing the intro of I Can't Stop The Love. I hoped they would do it but didn't actually think they would. I was also fully crying by now. Not hysterically, but just because I was so happy. And the family was there and then Jimmy (who I hadn't seen in person since god knows when) was there and the whole crowd was going insane. In that moment 2017 was actually 1994 and I was the child looking at the Tough Road video over and over again.. They moved on fast and every member sang one of their "own" songs, which gave them and us all the perfect opportunity to give them the welcome back they deserved. I don't really remember much from Why Why Why as I was still recovering from the realisation that I was actually at a Kelly Family show and that they actually opened the night with my all time favourite song, that had such a special meaning on that night. First Time was great, and my favourite thing was Patricia running down the catwalk with her arms spread wide and her skirt swaying, it was just such a Patricia thing to do. Imagine was cute as always, Because It's Love was pretty intense for me personally for Paddy reasons that I will not get into because I'm already being super cheesy and I didn't even miss Paddy a lot during the entire night. By the time we reached Red Shoes I was crying again. Along with almost everyone around me. And during Father's Nose my mum reminded me of the fact that I was so in love with that song when I was a little girl. For me, and probably for everyone else, one of the absolute highlights was Please Don't Go. I've always thought it was such an intense, strong and emotional song, and I absolutely did not expect them to bring that one back tonight. And again, I don't think I was the only one who felt that way because everyone was crying their heart out. And by the time the song climaxed in a Jimmy/Patricia slow dance right in front of us on the smaller stage, Patricia was crying to. It was beautiful and so powerful and they just sound so great together. I was also very happy that they were standing next to each other on the main stage because I had a great time watching them interact. I've always loved their connection. Keep On Singing was great, I mean, I don't really love it on the album but the message is nice and it was perfect for the concerts this weekend. Then The Wolf. We have to talk about The Wolf. How brilliant and hilarious. I love Joey to death but I just never really thought of him as the rockstar he tries so hard to be during the Wolf. I always kind of felt that he just ironically put on the black sparkly one piece and the platform heels and gives us his ironic view of what rock stars pretend to be and I love it. It even worked right now, in his suit jacket and jeans. Amazing, I loved it, the rest of the venue loved it. Everyone was wild and Jimmy was grinning his way through the entire song, probably somehow agreeing with my thoughts. Fell In Love With An Alien, I don't love it without Paddy, I just don't. I Can't Help Myself on the other hand was lovely and when Jimmy mentioned Paddy, Maite and Barby and then sang Cover The Road I was 100% ready to just go home. We Got Love was so uplifting and nice and Wearing Of The Green is another typical flashback and a song I remember very well from the 90s. As were Good Neighbor and Take My Hand. I traditionally held the hand of my mother on one side and the hand of the a complete stranger on the other. Amazing. The teary theme of the night was continued by Angelo during Brothers and Sisters, which was also the final song and it warmed my heart. It kind of showed again that this meant as much to them as it meant to us and it was the perfect ending of such an incredibly emotional night. Overall, I think it is pretty clear that I had the absolute best night. This reunion was needed and they did it in the best way possible. There were some technical issues over the night, especially with mics that weren't loud enough or not turned on at all ad guitars weren't plugged in when they should be but everyone was singing loud enough for those mistakes to almost go by unnoticed. I also have to say that each member sounded absolutely amazing and you could tell they really worked hard on the show. I also loved how supportive and encouraging the family was towards each other. They were hugging and applauding each other all the time and it was such a difference from the last couple of shows I attended before the break-up. The production was great to, with all the confetti, balloons, fire(work) effects and lights. It really turned the night into an even bigger party. And last but not least, a shoutout to my fellow Kelly-fans. For staying so supportive and down to earth and welcoming and excited and honestly being the best audience in the entire world. Right now I just want to go back, or skip ahead and live this Kelly tour-life forever. Just like I always imagined I would when I was a little girl. I will upload videos and pictures as soon I have wifi in my new house, which would be tomorrow and I am sorry that this was so long. I hope it was somewhat entertaining. it's inside your heart lady, where the battle is won"
Anjelica you wrote down exactly my thoughts i felt exactly the same. 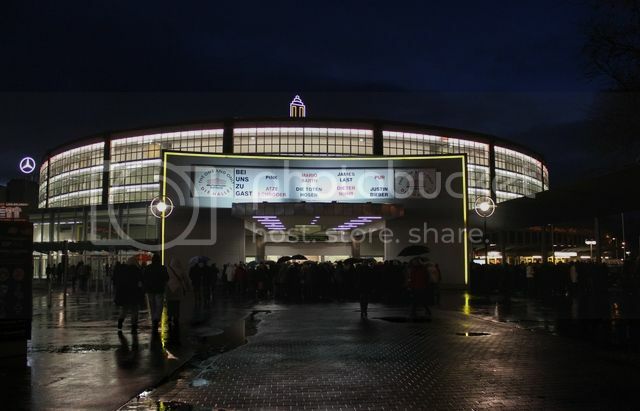 I was there on the 19th of may , friday concert. It was so magical the whole concert, i can't describe it! the Kellys were so grateful and full of emotion as well most of them shred a tear at some point during the night, they just kept thanking US that it is like a dream for them as well! 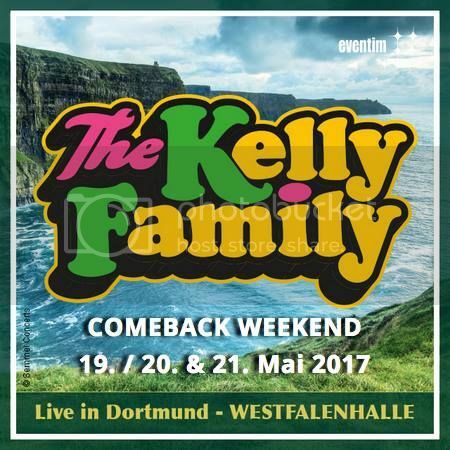 Everyone will treasure this concert in their heart, we fans and the Kellys,too! Feel the atmosphere in these video's, so that you can feel it too. Anyway...here is the set list!!! @Barbara Thanks a lot for the set list !! One of the songs from Paul was the lovely Irish song Loch Lomond. Can't remember if he sang it in the first or second part. It's clear to me that I'll be their fan forever. They've again touched me deep in my heart and I've been very emotional, especially at the beginning of the concert. I couldn't stop my tears anymore. It is so hard to describe it, today my colleagues ask "how was the concert" but I know that the word "Amazing" "Fantastic" or "Unbelievable" would not describe that Kellyfeeling you get in the concert. So, I went to the Sundays show and you know what it felt.. exactly like back in the 1998 when I heard the Kell family for the very first time. The atmosphere and the feeling is so strong you can not describe it properly. As my sisters said „You feel like you‘re not listetning to the superstarts but to your friends or family“, everything was so genuin, true, will all the emotions. Compered to the previous concerts (a while back ago) they were not so much as talks on the stage but I felt like with every single song they were telling the story. My favorite part was when Jimmy was about to sing Cover the road he was talking in German about ones, who are not here today. And in the end he said in English something like „Barby, Paddy, Maite we‘ve built this town together“. And also enjoyed the moment when the whole audience without any ecouragement was singing Nanana again and again and again. And Jimmy was just looking to the audience. The end was very emotional Patricia and Angalo were crying during song „Brother and sisters“ and Jimmy was kneeling and kissing the stage. I know, it is so frustrating. People ask me about the show and then they move on with their lives while in the meantime it's almost been a week and I'm still floating around in my bubble. also, I completely forgot to share my videos but I will share them asap. Some of them capture the Kelly-feeling quite well and i've shown them to many people instead of trying to explain it with words. Girls, I'm so happy you all had such a great time in Dortmund! Thank you for your reports! It's a great feeling seeing that you felt the same like me, and don't have to explain my feelings, not that I could anyway. Words can't express the emotions, feelings that I had and still have. A big dream of mine came true last weekend. Was the very first time when I saw John and was also the first time when I had the chance to be part on such a big concert with the Kellys. I had the privilege to be there on all 3 concerts, and all 3 evenings was just amazing. I didn't felt Paddy's or Maite's absence at all. They made such a great show that I enjoyed every second of it. It was perfect just the way it was! The audience was amazing, especially on Friday and Sunday, the Kellys did their best, gave everything into the concert. Before the show, on Sunday Joey and Angelo came outside and made pictures with fans, Angelo even sang, and after the show John did the same, he came outside and made pictures with everybody who wanted to. I had the chance to make my first picture with Joey, so happy with it! He was so calm and patient with all of us. Don't know what to say, I'm just very grateful 'cause I had the chance to be there, and to be part of this comeback of the Kellys! Was the best weekend ever! Agree, especially on Jimmy's face. wow, such lovely reports. It's amazing how everyone totally seems to feel the same and words seem just not enough to describe this feeling, this whole comeback weekend.